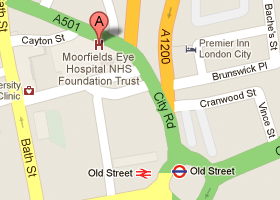 My NHS commitments are at Moorfields Eye Hospital, City Road and at our main hub at St Georges Hospital, Tooting. I run private clinics from Moorfields Private Outpatient Centre at Moorfields Eye Hospital in City Road at Parkside Hospital in Wimbledon and at the London Claremont Clinic on New Cavendish Street. 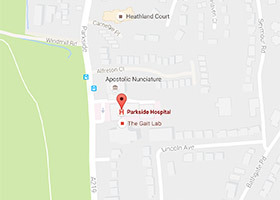 Parkside Hospital has on site parking which makes it a good alternative for those unable to use public transport or with mobility issues. Our routine surgery takes place at Moorfields Hospital, City Road, however theatre time can be organised at Parkside Hospital or St Georges Hospital by special arrangement. You can also make appointments from our online form.